A leading chemical company in US providing dynamic chemical process simulation software tools and services to chemical engineers for more than 30 years. CADSIMÆ Plus is their dynamic process simulation software, having tools and services which help design, investigate, improve, operate and optimize a new or existing chemical process. For Operator Training Simulators and DCS check out, CADSIM Plus generally communicates to DCS through OPC DA, and there are multiple ways where the speed of performance can be improved during this communication. Digital data from industrial plants is important in terms of monitoring, controlling and decision making for the plants performance. In todays world there is a need to make data available at userís finger tips. For Instance- customer wants to see his per day production chart sitting at home or on his mobile phoneís browser at the airport he canít see it live. He has to see the reports that are sent on emails to him. This restricts plant performance and demand extra man power to construct reports sitting in plants and then sending them across. In order to achieve this, customers have to pay high in terms of cost in order to push this plant data to cloud and then subscribe to it. 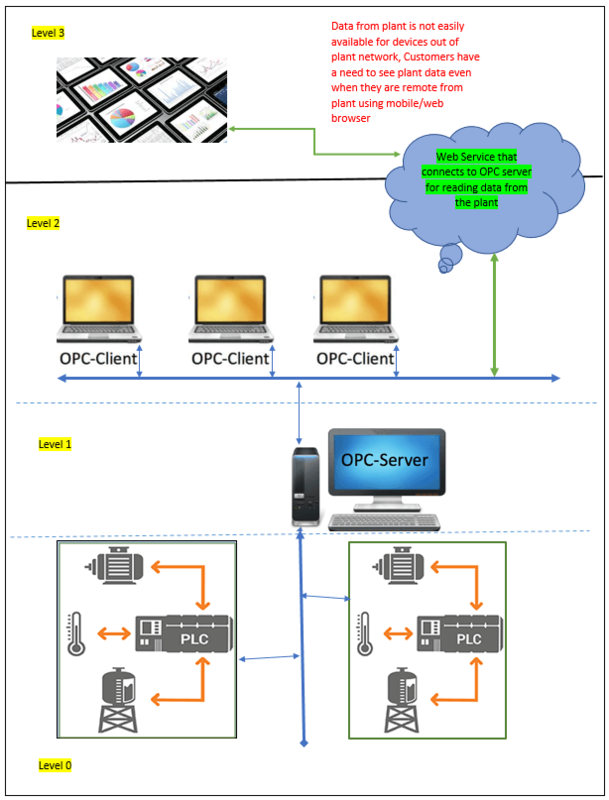 Following Fig Show how OPC Server Work. The solution proposed here solves the problem of data availability outside plant networks from classic OPC servers. This data from classic OPC servers will be fetched and published to users on the web browsers and mobile apps from anywhere. End customers can access their plants Real-time and Historical data from anywhere on Laptops, mobiles, tablets irrespective of their OS platforms. Data made available on the web browsers can be viewed in tables, charts. Data fetched on this end devices can be saved in the form of CSV files so that any 3rd party application like excel can read csv to interpret information for further processing. Users can control plant systems by writing values to OPC tags from the web OPC client. Based on customer needs this solution could be extended further and futurism can dwell its entry in the industrial automation domain.